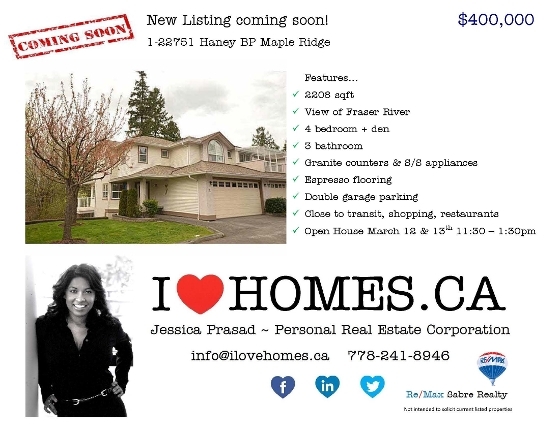 New Listing in Maple Ridge coming soon! Welcome River's Edge! This 2200 sqft end unit home Features 3 bedroom, 4 bathrooms and views of the Fraser River. Enjoy the upgraded slate floors, faux rock feature wall as you enter. Slate floors and backsplash continue in the designer kitchen, upgrades are high end cabinetry, stainless steel appliances, real sillstone counters tops. The living room and dining room feature real engineered hardwood floors, designer paint and decor, cozy gas fireplace, Upstairs is a large master bedroom with updated custom vanity and basin sink in ensuite bathroom. 2 more generous bedrooms & renovated main bathroom. Fully finished basement with rec room, guest bedroom & 3 piece bathroom (RI for shower). Entertain on 2 large balconies off greenbelt and double garage parking. Centrally located, just 1 km to the West Coast Express, Haney Wharf, Casino, an Alehouse and so much more.